Your favorite chicken enchiladas reinvented into a quick and flavorful pasta dinner, perfect for any night of the week! Happy 2016! And now that we’re into the new year, fess up… how long will you be writing 2015 on your checks, etc? Adjusting can be so hard. What’s funny about that though is I’m sure people don’t have nearly as hard of a time adjusting to a new month when writing dates out…right? It’s just the year. And maybe that’s because we’ve had the same date for a full year vs 30 days, but still. Fingers crossed I’m not still writing 2015 in June. After having our tree up for more than a month, we finally took it down over the weekend. I’m so glad to have things back to normal. Or at least mostly back to normal. We still have some rearranging to do but the big stuff is done. It seemed like this past weekend was the big decluttering weekend for most, as I saw a lot of people talking about taking their trees and decorations down. Did you take yours down already or are they still up? We also decided to take all of the lights off of the tree before putting it away, since next year when we’ll be replacing all of the lights. What a pain! If you’ve never replaced lights on a pre-lit tree, have your wire cutters handy. The strings were wrapped around every branch multiple times. So glad to be done with that… at least for the next 11 months when we have to put them back on. I’m full blown obsessed with all things enchilada flavored. So, don’t be surprised if you see many more recipes, in the coming year, calling for that delicious spicy sauce. If you’re looking for an easy and flavorful dinner, look no further. This is a crowd pleasing, flavor packed dinner that comes together in just 40 minutes! Your favorite chicken enchiladas reinvented into a simple pasta dish, perfect for any night of the week! 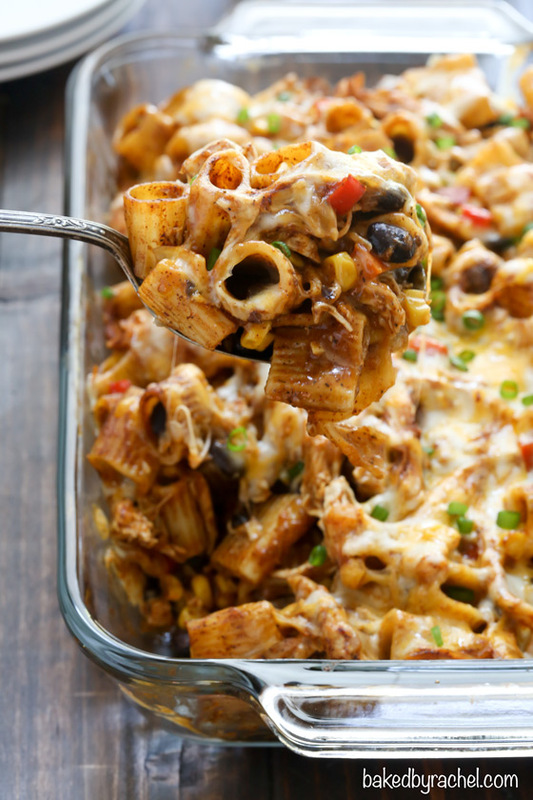 Be sure to add this chicken enchilada pasta bake to your weekly dinner plan! In a small saucepan, combine sauce ingredients, whisking together until fully combined. Set over medium-low heat, whisking occasionally until mixture thickens. Remove from heat and transfer to a clean bowl, pressing plastic wrap to the surface to prevent a skin from forming. In a medium skillet over medium heat, saute bell pepper and onion with olive oil until tender and onions are translucent. Add chicken, corn and black beans, tossing occasionally until heated through. Transfer to a large bowl. Prepare pasta according to manufacturer's directions and drain. Combine pasta and chicken mixture with prepared sauce. Toss well to coat evenly. Stir in half of the shredded cheese. Transfer mixture to a 1 1/2 quart baking dish. Top off with remaining cheese. Bake for 30 minutes or until cheese is completely melted. 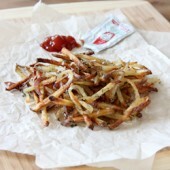 Sprinkle with freshly chopped green onions. Serve with optional tortilla chips and sour cream. *Mezzi rigatoni or medium shells are recommended. 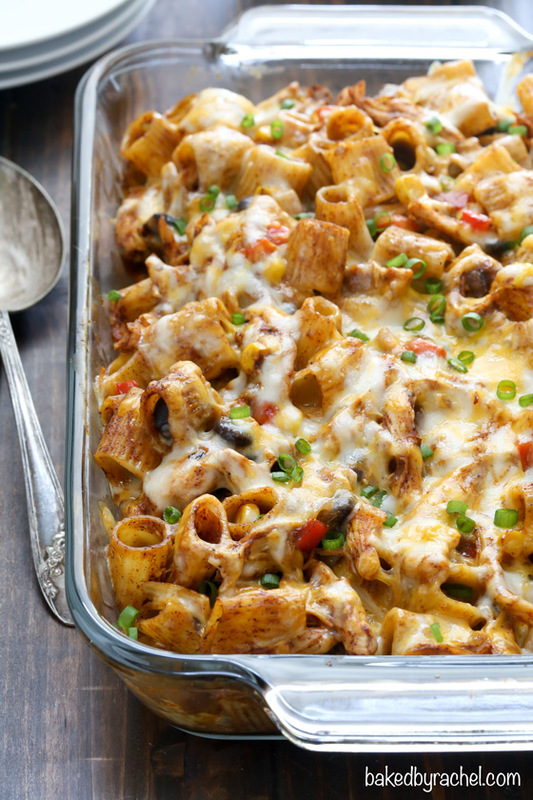 I am with you on being obsessed with enchilada flavors–so this pasta bake is perfect for me! 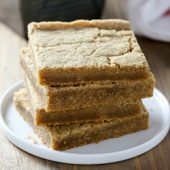 This looks fantastic, quick and easy! I love it! 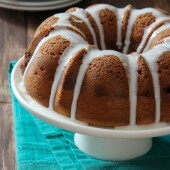 Oh my, this looks so mouthwatering and I love how quick and comforting it is. We didn’t get any trees last year since we traveled most of the time. However we did major decluttering and could not believe how many unused items we found. Decluttering is seriously the best. Such a good feeling to be free of it all! Oh wow – I haven’t put any of my Christmas stuff up yet – maybe I need a big dish of this to motivate myself! My daughter loves pasta but she has to settle for GF pasta and i’m thinking this recipe is so flavorful, she wouldn’t mind eating her gluten free pasta at all! Yup, I will definitely be writing 2015 for a long time to come. Sigh. Back to work today. This dish looks so good… I want comfort food right now but my body is saying I need salad or something. Bah! I think we’re all having the big “sigh – back to work” feeling. Hopefully the week flies! What a delicious looking pasta! Love it ! 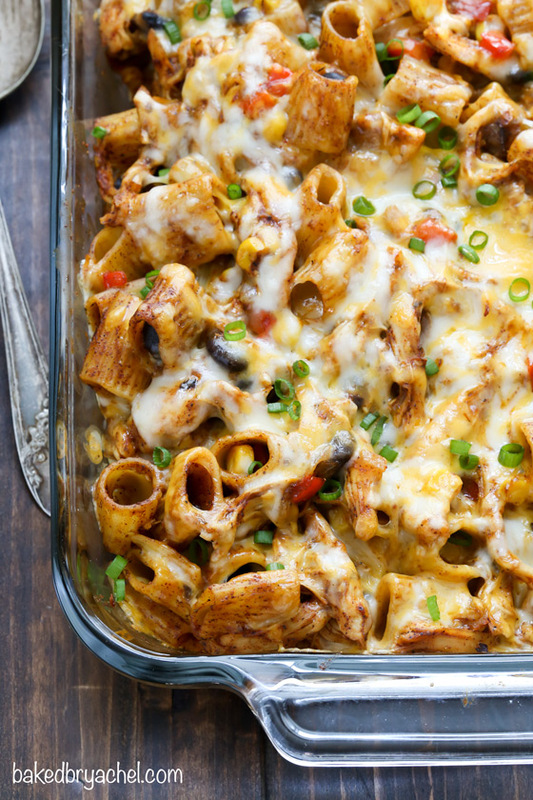 Oh man, adding enchilada flavors to this pasta bake is a genius idea!! Perfect comfort food, Rachel! Carbs and cheese, just what I need to start off the new year!!! I make enchiladas quite frequently for dinner. I love this twist though, I am definitely going to have to give this a try! I’m just not ready to take our tree down yet. 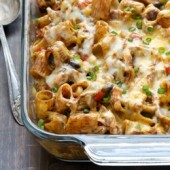 Love this idea for combining enchiladas with a pasta bake — my son would go crazy for this! Our tree is still up and it is really starting to bug me! Is it bad I want the space back?!?! We need to do some serious decluttering as well. This enchilada casserole looks awesome! Obsessed with the flavors of this pasta!! And I love the pasta shape you used. I need to use that type more often. Something about it makes the dish look that much better! You definitely do! They’re a fun change from the standard noodles.